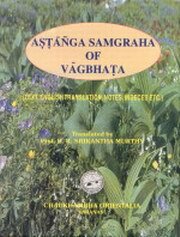 This book 'Astangasamgraha' of Acarya Vagbhata is an ancient authoritative text on Ayurveda, studies since many centuries by students, scholars and practitioners of Indian medicine. Because of its archaic style of composition and terse language certain amount of difficulty is being experienced. Desire for translation of the complete text either in Hindi or English is being keenly felt. This translation in English hopes to fulfil the need.